What sweet words I find in Isaiah 43. Words to remember as I travel through life. Or at least until life sweeps me off my feet. What do I do with these promises? When life is upside down and flames set every dream ablaze, are these words true? Four miles from my home, I dragged myself into a hotel and reserved their last room. The sweet African American gentleman behind the desk asked if I was okay. I could not utter a single word, not even a whisper. I merely shook my head “no” as tears streamed down both sides of my face spilling onto the hotel counter. I fumbled for my credit card to pay for my room. With so many tears, I couldn’t see to sign my name. Awkwardly, I took my key as the quiet-spoken gentleman asked, “Should I call someone for you? Would you like for me to call the police?” There was much concern in his voice. Once again, no words would come. Another nod “no” was all I found. Armed with necessities for the night, I found my room and collapsed on the bed. I wanted to go to sleep and wake up the next day with a new set of life circumstances. However, sleep was not coming, only tears. My life had fallen apart. Not only swept off my feet, I was drowning. A few weeks previously, my husband had completed a week-long chemo drug for the Progressive MS taking a toll on his body and our family. I had three kids at home who needed their mama and their dad. Not to mention two weeks earlier they all three had head lice. So stressed, I had not eaten for several many weeks and my body was shutting down from lack of nutrients. Days prior, my husband fell and broke his hip. He was transferred to a rehab hospital and I, well, fell apart. I couldn’t stay with him in rehab until he could get a private room. I was so sick and such an emotional mess when I left his bedside, I couldn’t go home to my kids. I was desperate and alone. Every dream I had for my life was gone. The nice secure life I planned for my children was non-existent. My faith was nearly gone. 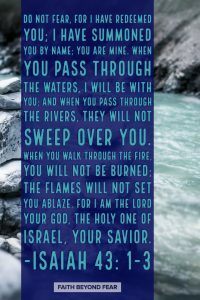 This promise in Isaiah of not being overtaken by waves or set ablaze, well, it was for lack of a better word, hogwash! Fear had invaded the deep crevices of my heart. Would I ever get my husband to the point I could take care of him at home again? Would he survive being in rehab hospital with a depleted immune system from chemo? How would I ever learn to eat again? How could I take care of three kids and my husband in the hospital at the same time while being so sick myself? Laying on that hotel bed, questions rolled over in my head and my heart. Soon that all too familiar feeling of not being able to breathe overwhelmed me. The first time I felt that feeling, I thought I was dying. I was certain an ambulance needed to be called. However, I learned lack of oxygen to my brain was called a panic attack. If only that gentleman from the front was in my room, he would call for help. I would nod my head “yes” this time. But alas, he was not there. I was alone with my fear-filled heart and my run-out faith. This was a defining moment for me. It was a moment I desperately desired someone to be with me, but I also wanted no one with me. A moment where my faith came to a crisis, would I believe the promises in God’s word or would I turn my back because He had failed me? 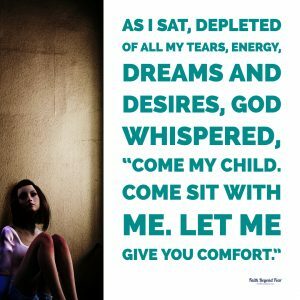 When every ounce of me had drown away in tears and I was at the complete end of myself both physically and emotionally, I sat motionless on the strange, unfamiliar bed. There was nothing left of me. I sat. My thoughts were God doesn’t want me to tell Him how I feel about Him. A good Christian girl would never say the things I felt. However, God continued to nudge my heart. And for the first time, I unloaded my heart on God. I told God how I felt about Him, about my dreams that been set ablaze, and the life I no longer had. I verbalized my fear-filled heart loudly to Him. I informed him that my run-down faith had me exhausted. God’s surprising response to my angry, fear-filled, faithless words was, “Thank you. Thank you for sharing the innermost part of your heart with me. Just let me give you rest for your weary soul.” God begin ministering His love, kindness, gentleness, and faithfulness to my raw heart when I was real with Him. God met a fear- filled girl with a run-down faith in a hotel room that night. At the complete end of herself, she shared her innermost thoughts and feelings with Him. And there in an unfamiliar place, a redeeming work was done. That girl would never be the same. Her relationship with God would always be different, and that’s a good thing. When she left the hotel, her fears weren’t gone. They still existed, but her faith was greater than her fears. Does being a fear-filled girl with a run-down faith resonate with you? God desires to fill you with comfort and hope in the midst of your fear-filled heart and run-out faith. Will you let Him? Will you allow your faith to be elevated over your fears? Take away: God desires to fill you with comfort and hope in the midst of your fear-filled heart and run-out faith. Want to Read More Stories of People Reaching Beyond Their Fears? Thank you, Karen, for sharing your testimony of overcoming fear with faith. Thank you for sharing how this is an ongoing battle and that God knows how to encourage us to be real with our struggles. So powerful! It’s amazing how God works like this in our lives. I know so many people who finally found a real relationship with God when they finally were REALLY with Him. Thank you for sharing how important this is! Thank you for this beautiful testimony of the grace of God to provide for you so tenderly in your brokenness. I am grateful of the reminder that when we pass through the waters, he is there. These storms in life remind us of the loving protection of our Father. Blessings. Thank you for being real with us and sharing your doubts and pain as well as God’s abundant love and understanding. You are very welcome! I pray God reminded you of His care and love as you read! Thank you! He does indeed pick us up in the middle of brokenness! I read this post with tears in my eyes. I’ve been scared at times to vocalize what I really feel to God as well. But, he sees it anyway. And he can handle it. What a beautiful post about his faithfulness. Thank you for sharing this. I pray it will make its way to those who need it most. Every time I write I pray over my writing and ask God to use it to make a difference in others lives!! I don’t know why we get this idea that we can’t tell God what we really feel!! Such faulty thinking! Being vulnerable and real is what He desires! Thank you for sharing with such honesty here, Karen. I was moved by your story on how you and your family have struggled. What you share here is a much-needed reminder of how quickly what we have can be changed into something we hardly recognise. Your story is a great example of what Faith can do when God’s in control. Thank you for your sweet words. God is faithful. 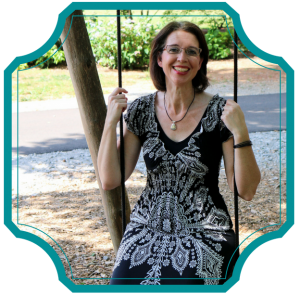 My blog entitled Glimlpses of Faith and Struggles reminds readers all the time that even a little faith is enough to get you through the toughest of tough! So no matter what comes your way, you are a testimony to His strength even with a tiny faith. I am crying just reading this! How easily you could have just turned away from God. How easily you could have just left your hurt, walked away and never walked back to God. I am so impressed by you and your strength it’s insane. Thank you! You are very correct. It was a turning point for sure!! I’m so thankful that even in deep pain God continued to draw me near!! GOD IS GOOD. Thank you so much for sharing your story. It’s such a beautiful feeling to know that God truly hears our every thought and cares for us. You are welcome. He sees, He hears, and He cares. If we could only learn to sense His care in times of stress, then I think we would live with a lot less anxiety! I’m working on that in my life. I love this post. We want God to take away the bad circumstance. God wants to use the circumstance to draw us closer to him. He hurts with us as we go. Great post! Thank you! I also tend to go to God with requests. Answer them like I want instead of giving Him freedom to answer the way He wants. Living in complete surrender that is where God desires for us to live. Thank you for being so open and honest about your struggles. Sometimes we forget how hard it can be in the midst of a crisis and we think others handle situations better. No matter how hard, God will always be by our side even when we can’t feel him. Yes, He is always with us! I am always praying that God would show me His fingerprints as I go about my day so I don’t miss Him working. Tears are flowing down my face. Thank you for sharing with us. In good times and in bad times, He is with us. We need to share with Him, even though He already knows our every thought. We are loved by Him. Tears are beautiful. I am reminded of the song When Im With You there’s no need for walls you can see right through. And I lived my life thinking I had to have it all together to come to him! What a crazy idea. He wants us just as we are. Wow, Karen. Thanks for sharing your story. I can actually relate to a lot of what you’ve been through. It’s powerful to face God and be raw and honest about what I’m feeling. I didn’t think that for much of my life. I guess I was afraid of divine retribution or something. In any case my honesty with God was the catalyst for him being able to draw out the poison and heal me. So, I’m with you. God’s kindness in my hurt was healing and restorative. I’m glad you had the same experience. Anytime we allow God to be in the middle of our mess, redeeming work will always be done! His kindness and love will always saturate our hearts. Thankful you have experienced His kindness and love in powerful ways! !